A south east view of one of the prebendal houses in the Cathedral College of Durham. After the dissolution of the Cathedral priory, the monastic buildings were converted into houses for the use of the prebendary canons, whose assembly had replaced the community of monks. 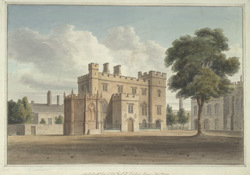 This medieval court became known a the College. Daniel Defoe, who visited in the early 18th century, commented that within the compact bailey peninsula were 'the fine houses of the clergy, where they live in all the magnificence and splendor imaginable'. The Reverend Prosser was appointed as a prebend at Durham Cathedral in 1804. His house was the former monastic guest house. In the early 19th century it was refronted with a Gothic Revival style veneer.